Bosch AQT 33-10 is one of the latest high pressure washers offered by this global tool manufacturer and today we are going to take a closer look at it. As promised in the end of last year we are going to deliver more product test and reviews and that's why we are starting from the very beginning of 2014. The AQT 33-10 is a the budget offer from Bosch to compete with the world wide popular high pressure washers from Black & Decker. In this review we will go through this product's main specifications and also share our first impressions after we got our hands on it few days ago. The Bosch AQT 33-10 comes in the package complete with fixed flat spray nozzle, high-pressure spray gun, lance, transparent water filter (F 016 800 363), 3 m high-pressure hose and 5 m mains cable. 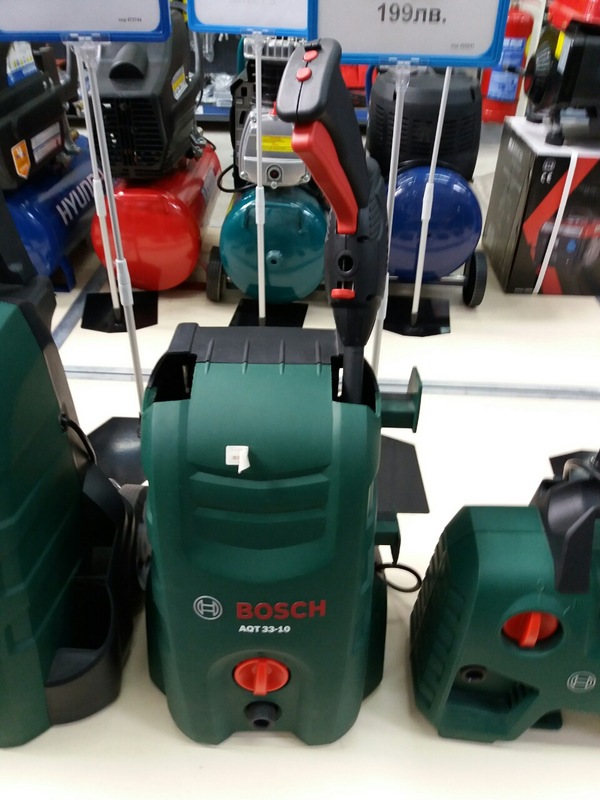 Bosch AQT 33-10 doesn't have any of the additional accessories offered in the more expensive models Bosch AQT 35-12 Plus and Bosch AQT 37-13 Plus which come with wheels, deluxe patio cleaner and wash brush. From what we have seen in the online ratings and reviews the Bosch AQT 33-10 receives some controversial grades due to the fact that this washer is a bit more expensive than the equivalent models from Black & Decker and SKIL. Our first impressions with the AQT 33-10 were actually quite positive. This pressure washer is solidly build and leaves the impression for durability unlike some of its rivals which look more like cheap vacuum cleaners. The parts and accessories are also well made from durable plastics which is important considering the fact that this tool will be exposed to different atmospheric condition when used for washing cars and other useful activities. The 1300 W is a bit noisy but this is expected behavior from most high pressure washers. We had some difficulties with fixing the spray nozzle and the spray gun but I guess this is only in the beginning and most owners will get used to using it pretty quickly. Other than that it is all good words about the AQT 33-10. One of the benefits of this pressure washer is the auto-stop function which ensures energy efficiency. You also have the option to use detergent thanks to the special system this washer has. As I already mentioned the Bosch AQT 33-10 is a bit more expensive than some of the competitors in the budget high pressure washers class. In India it costs Rs. 7500. In Europe it can be found for around 100 Euro. For a comparison one of its direct competitors the Black & Decker PW1300TD costs some 20 Euros less. In the rest of the world the AQT 33-10 costs around $120-150. You can definitely find cheaper pressure washers than the Bosch AQT 33-10 but if you want the best entry level washer than this one is definitely the right choice. It would be nice if this tool was set on wheels but I guess Bosch wanted to keep this extra feature for the higher models. We will test this washer by trying to clean up a very dirty vehicle and share our impressions with the performance of the AQT 33-10. Until then stay tuned and check the rest of our reviews.